Uma cerveja se faz favor – A beer please! Madeira, an island lost in the Atlantic Ocean is world famous for its fortified wines, its mild sub-tropical climate, and its lush vegetation. However, according to many, locals and tourists alike, there is nothing better than a good cold beer to cool off and admire the fabulous views all around. Uma cerveja (bem fresca) por favor – a (very cold) beer please. No, not any beer, Madeira’s own beer, namely Coral! The Madeira Brewery (Empresa de Cervejas da Madeira or ECM), established in 1872, is now the largest drink producer and distributor of Madeira archipelago. The Pestana Group owns ECM. The marketing department of ECM is known as particularly active. They pay special attention to the packaging as well as to the final product. For the 600 year festival, they for example created a limited edition beer edition. The main beer brand is called “Coral”. So, yes this is the beer you order on Madeira! Coral is a clear, pale golden color, very aromatic and refreshing pilsner type beer made from malt (from Czech origin) and raw grains. 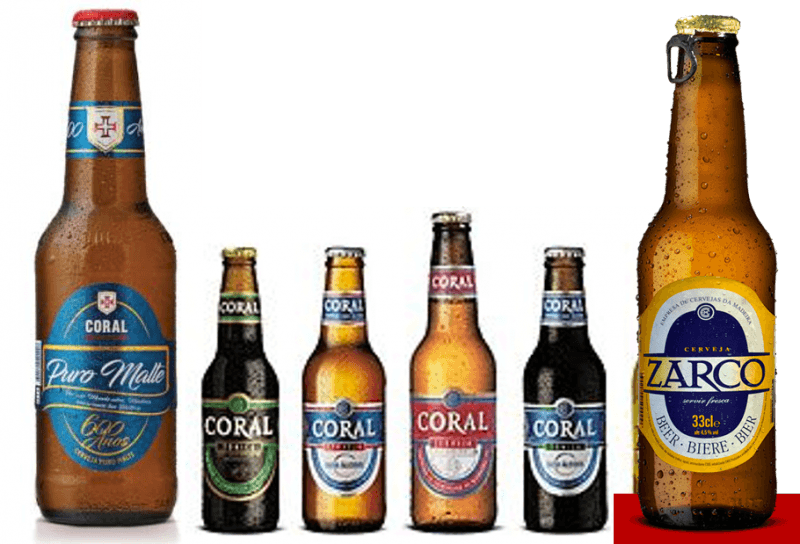 Coral beer comes various versions (Branca – Lager, Tónica – stout and low-alcohol variants of both lager and stout) and sizes. The Madeira Brewery also offers the Zarco which is a lager type beer. Depending on the place, tremoços are often offered with a glass of wine or beer. When you cheers, you can say either “Saúde” (pronounce it saw-OO-jay) or “tim-tim,” (pronounced ching ching, similar to Italian). Furthermore, the company offers a wide range of non-alcoholic beverages. There are two kinds of non-alcoholic drinks: the carbonated ones and the still ones. Brisa is on every menu card and in the stores on Madeira. Brisa is a range of soft drinks (refrigerantes). There are many different kinds but our all-time favorite is the Brisa Maracujá – passion fruit soft drink. The Empresa de Cervejas da Madeira also produces and sells bottles water (with or without gas) and Laranjada.